In many cases involving domestic violence, one or both parties may request that the Court issue a protective order (also referred to as a “restraining order”) that would prevent the other party from engaging in any future contact. Police officers often encourage victims of domestic violence to obtain these protective orders and they are typically required in any criminal case involving domestic violence. A protective order is formal order authorized by a judge or other bench officer that prohibits one party from having any contact with the protected person. To be valid, the protective order must be authorized by a bench officer and must be served on the party from whom protection is sought. This means that if a person is not aware that he or she is the subject of a protective order, he or she can not violate it. 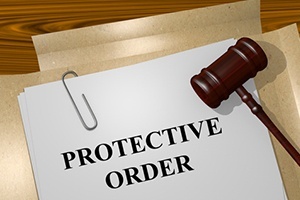 A protective order typically prevents a person from having any contact from the protected party. This would include direct contact as well as indirect contact through third parties (other than an attorney). The target of the protective order would not be allowed to call, email, text message or contact the protective party through social media. Violating a protective order can lead to additional criminal charges under California Penal Code Section 273.6 PC. Protective orders require the target of the order to relinquish any firearms and he or she would be prevented from owning firearms for a specified period of time. There are several different types of protective orders that can be issued. At the time of a domestic violence arrest, the police will ask the victim if he or she wants an emergency protective order that would be issued immediately. The emergency protective order is only valid for seven days, during which the protected person can apply for a permanent protective order subject to a hearing. The victim may petition the Court for a domestic violence restraining order. The Court may issue a temporary restraining order (“TRO”) while hearing is pending. The Petitioner must meet its burden in showing by a preponderance of the evidence that the protective order is justified. The target of the protective order, or respondent, can challenge the petition and present evidence at the hearing. Domestic violence restraining orders are available when there is a current or previous romantic relationship or there is a familial relationship. People who do not have this connection can request a civil harassment restraining order. In addition, those who are 65 or older can apply for an elder abuse restraining order when they have been the victim of physical or financial abuse. When a defendant is arraigned on a domestic violence case, the judge will typically require that he or she be present in order to be served with a protective order. This protective order will remain active while the case is pending. The judge can also issue a protective order as a term of probation for those who are convicted of a domestic violence offense. In some cases, the judge may consider reducing the protective order to a Level One protective order that would allow peaceful contact between the parties. However, a judge will want to hear directly from the victim before reducing a protective order. If you or a loved one are the subject of a domestic violence protective order, it is critical that you discuss your situation with a qualified attorney as soon as possible. Michael Kraut is a former Deputy District Attorney with over 14 years of prosecutorial experience who is highly regarded as a top-notch litigator. Mr. Kraut fights hard on behalf of his clients who are charged criminally with domestic violence or who are the targets of a protective order. For more information about domestic violence protective orders and to schedule your free consultation, contact Michael Kraut at the Kraut Law Group located at 6255 Sunset Boulevard, Suite 1480, Los Angeles, CA 90028. Mr. Kraut can be reached 24/7 at 888-334-6344 or 323-464-6453.